Trudging to school barefoot over broken glass and hot bitumen in the sweltering far north Queensland heat. So was the daily routine for the students in the remote Indigenous community of Aurukun before prep teacher Tess Moore took charge. What we consider an everyday necessity – shoes – was missing from the feet of the community’s 204 students. The arduous walk to school without shoes meant teachers would spend half the morning bandaging feet and treating wounds instead of helping the students learn. Now every student has a pair of shoes thanks to the young teacher’s campaign to get her kids back on their feet. Tess, 25, tells Babyology last year was a “testing” one for the disadvantaged community and she thought about generating some positive news. She created the Happy Feet Project. Working for two years in “the most disadvantaged community in Queensland”, Tess spent much of her teaching time tending to injuries like a nurse. She says shoes for students shouldn’t even be an issue in Australia. But the support was overwhelming once word got out about her cause. Shoes in all varieties and sizes came flooding in from individuals and shoe brands offering help. 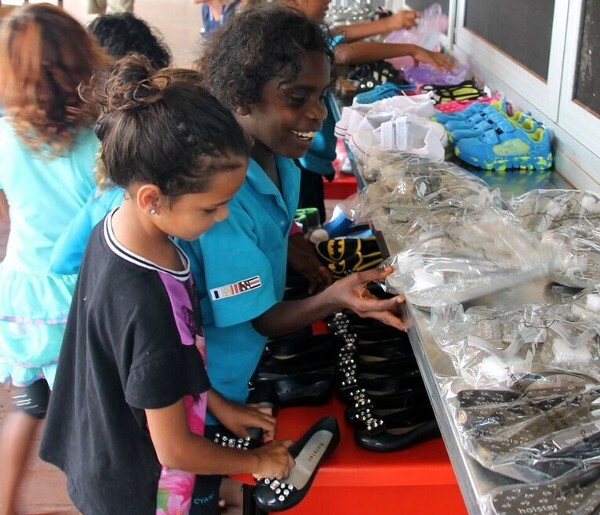 Australian jelly shoe brand Holster donated 270 pairs of shoes to Aurukun. The shoes, made of non-toxic PVC or natural rubber, are the ideal shoe for the students who need a waterproof, open and quick-dry shoe to wear in the wet season. The donation is part of a larger ongoing commitment for Holster, which wants to donate more shoes to other remote Aboriginal communities. “We feel truly grateful to be able to give hundreds of children in Aurukun a pair of shoes, which may potentially change their lives,” says Holster co-founder Natalie Miller. Tess says as soon as the Aurukun children received a pair of shoes “their face lit up”. “They now have a sense of pride in their appearance and it’s good for them to have that confidence and to take ownership of something,” she says. Tess is now working at a state school on the Gold Coast. The Happy Feet Project is still accepting donations because the lack of shoes “is an ongoing problem”, Tess says.